A walkway made of stepping stones is a simple, inexpensive way to add charm to your landscape. 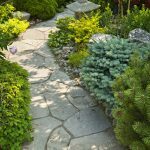 Stone paths offer a practical route for foot traffic from the sidewalk or driveway to your front door and along the side or back of the house. Consider your home’s architecture when choosing a style of stepping stone. If there is keystone, brick or faux rock on your exterior walls, bring the same texture and color into the stepping stones. The path shown here was selected to coordinate with the coral hues of the patio pavers. Matching the color or texture of a nearby landscape element will give your path a professional look. Choose a surface with enough texture that it won’t be slippery when wet, especially if the path will be near a pool. And avoid very dark stepping stones, which can become too hot for bare feet in the summertime. Determine the boundaries of your path and remove all vegetation from the area. If you use an herbicide, apply it at least twice with three days in between. Once the vegetation is gone, put down 2 inches of leveling sand. Drag a 2×4 across the surface of the sand to make it very level. To keep the pebbles from slipping into the surrounding landscape, you’ll need to install edging. For a clean, minimalist look, a narrow strip of black metal works well. For a country cottage ambience, use brick-shaped pavers that coordinate with your stepping stones. Dig a trench that allows you to place the edging material deep enough so it won’t be a tripping hazard. The top of the edging should be just an inch above the pebbles. When a project calls for a professional touch and strength. For landscaping done right call, Lawn Care Flowermound for a free consultation.